TSG provides specialized expertise that would be cost prohibitive and distracting to most small businesses. Contact us today regarding your project needs. TSG offers a fully managed solution designed to meet your organization’s needs on an affordable "pay-as-you-go" model with no capital expenditures. TSG becomes your IT department and single point of contact for all IT requests, support and services. 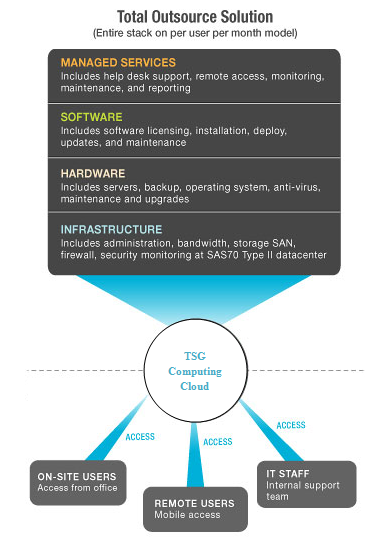 TSG will manage the servers, infrastructure, applications, security and backup providing a stable and secure operating environment for your entire IT operations. At the same time your company maintains full control over the applications and business processes without having to deal with the day-to-day administration, backup and management of servers, security, connectivity, power, backup and other routine IT processes.